Ultherapy is the only non-surgical treatment cleared by the FDA to lift skin on the neck, under the chin and above the brow as well as improve lines and wrinkles on the chest. Considered an “uplift” not a “face lift”, Ultherapy uses ultrasound technology to stimulate collagen production deep within the skin. This is what provides a lift from the inside out. By using ultrasound, Ultherapy is able to bypass the surface of the skin and address the deep layers to lift and support the skin. Heat is delivered at precise depths of up to 4.5 millimeters which creates a contracting and tightening effect. 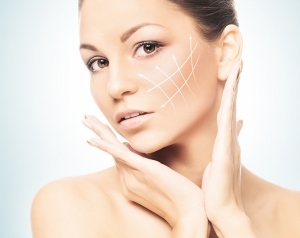 Ultherapy is considered a safe therapy with more than 350,000 procedures performed. It is growing rapidly as a very popular treatment for aging skin. Ultherapy may produce an immediate result, but the most noticeable results are common 2 to 3 months after the procedure. Patients may need only one treatment to reach their desired goal, however based on each individual’s case, additional treatments or touchups need to be performed to enhance the results. Directly after an Ultherapy procedure, the skin may be flushed with some slight swelling, tingling and tenderness to the touch. Bruising may appear and the patient may feel some numbness in the area. These side effects typically subside on their own within two weeks following the procedure. Before any procedure is performed it is important, for better results and faster healing, for the client to have their skin in the healthiest condition possible. While Ultherapy tightens the muscles, it does not affect the skin’s surface. Beginning a home protocol of NeoGenesis S²RM® products prior to the procedure will ensure that the skin has all the nutrients it needs to heal faster and more beautifully. Our Skin Serum, used twice daily and followed by our Intensive Moisturizer is the best insurance to keep your skin its healthiest. For more damaged skin, Recovery is recommended in place of the Skin Serum and followed by the Intensive Moisturizer. Immediately following an Ultherapy procedure, our most advanced product Recovery should be applied twice daily, followed by our Intensive Moisturizer. This will help to heal any swelling, bruising and pain associated with this procedure in a faster and more natural way. Continue this post procedure protocol until the treated area has healed completely. The patient can then switch to the maintenance protocol of alternating the application of Recovery with NeoGenesis Skin Serum. For the maintenance protocol apply Recovery 3 – 4 times per week and Skin Serum on the days when not using Recovery. Always follow the application of Recovery or Skin Serum with the Intensive Moisturizer to create the perfectly hydrated state within the skin. © NeoGenesis Inc. All rights reserved.